Having trouble building your CV? Hurray! you are at the right place to find everything related to CV making and how to make a CV from scratch! Fortunately, knowing how to make a CV is not purely a matter of luck. It’s both an art and a science. Did you know that there are successful and unsuccessful CV format? Do you know the 3 things people look at first on a CV? The most common mistakes when writing a CV? Do you know what the best CVs look like? It’s difficult to overstate the importance of a CV. Not only are CVs required for the vast majority of jobs in Nigeria, but they are the initial filter which employers use to deal with applications, in many cases vast numbers of applications. These days, PCs and the internet have made it so easy for people to apply for jobs with minimal effort, that even the least attractive positions can attract a huge number of applicants. In such an environment, your CV has to work exceptionally hard to stand out and to win you an interview. Even a good CV may not be good enough. The sheer numbers game often means it has to be excellent. Ansa Careers blog was created to really help countless job seekers overcome their struggles of unemployment and secure a good job that pays well and give real satisfaction. That’s what we’re all after isn’t it? For this reason I constantly emphasize the importance of making a good cv/resume. As we all know that there’s a lot that goes into finding a job. Each is structured differently and it can be challenging finding your dream job. Your course of study, Qualifications, CV and Interview skills are four key components – you have to get them right to land your dream job. Ansa Careers blog is in a privileged position to know what makes a CV stand out and what makes it excellent rather than simply good. 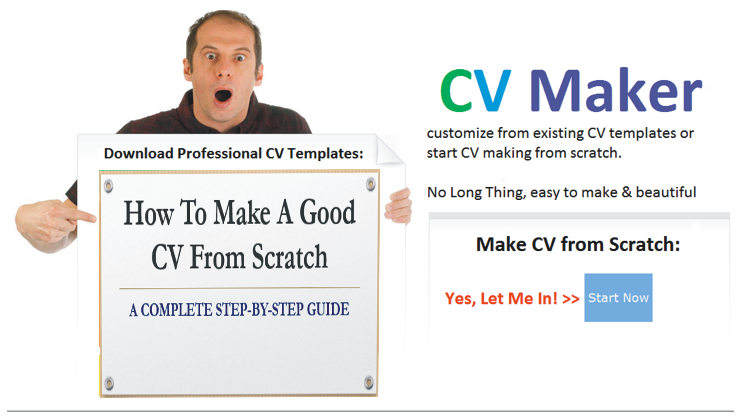 In this eBook I am going to show you how to make a CV from scratch that will get you an interview. The methods here are extremely simple but very powerful. This is especially true if you can combine them together and create an eye-catchy CV that your potential employers will fall in love with. Free CV Template – great for getting started but you should avoid certain pitfalls. What to look out for and how to use them. How to make a CV – a step-by-step guide to help you break writer’s block and create the perfect CV. A choice selection of the best CV writing tips available anywhere. ← Unbelievable: Top 10 Killer Tips To Impress Employer at Job Interview! I already know i method how to make Cv but your method i think is more easier.